Various models of school bags are available in the market entice students to use different types without worrying about muscular and physical problems they may cause. Backpacks, front packs, double packs, front backpacks, low back packs, shoulder bags, hand bags and wheeled bags are some of their types. Daily carrying of these bags cause heavy impact on spinal cords of young students and is the main reason for their disorders. Several studies in different countries on bags, revealed that the users’ body posture change while carrying them and neglecting ergonomic principles in their design and their effect on children’s health. Some of these studies have concluded that improper carrying of bags, their weight, their bad form and size and the duration of carrying them are the main reasons for lower back pain. Backpacks are of special popularity among different groups of individuals, especially students of young ages. Across the country, millions of schoolchildren are racing out to the school buses/vans carrying their text and exercise books in overstuffed backpacks hanging on their shoulders. While carrying a backpack to school each morning might seem harmless enough, it can cause some painful back and neck problems for the children. While many factors contribute to back pain, poor posture, prolonged inactivity, stress from sports and other activities, heavy backpacks contribute to worsen posture, muscle soreness, shoulder pain and numbness and tingling. A study carried out on 10-18 year old children, the daily physical stress associated with carrying backpacks cause significant forward lean of the head and trunk. It is assumed that daily continuous postural adaptations could result in pain and disability in school children. Non-standard body posture in schoolchildren due to carrying heavy bags have raised concerns in parents, teachers and health authorities. Loads imposed by these bags may have essential roles in skeletal-muscular disorders in students. Two main disorders thought to be induced by carrying bad backpacks are kyphosis and scoliosis. Researchers have found that carrying backpacks weighing over 10% of the body weight ends in kyphosis and lower pulmonary capacity in individuals. Studies have revealed that heart beat rate, blood pressure and energy used increased in 10 year-old schoolchildren carrying bags of weights over 10 and 20% of their body weight. Moreover, carrying backpacks weighing over 10% of body weight induces negative changes to the children’s shoulders and necks. Skeletal disorders related to carrying bags are concurrent effects of factors like extra weight, size, form and length of bags by students. 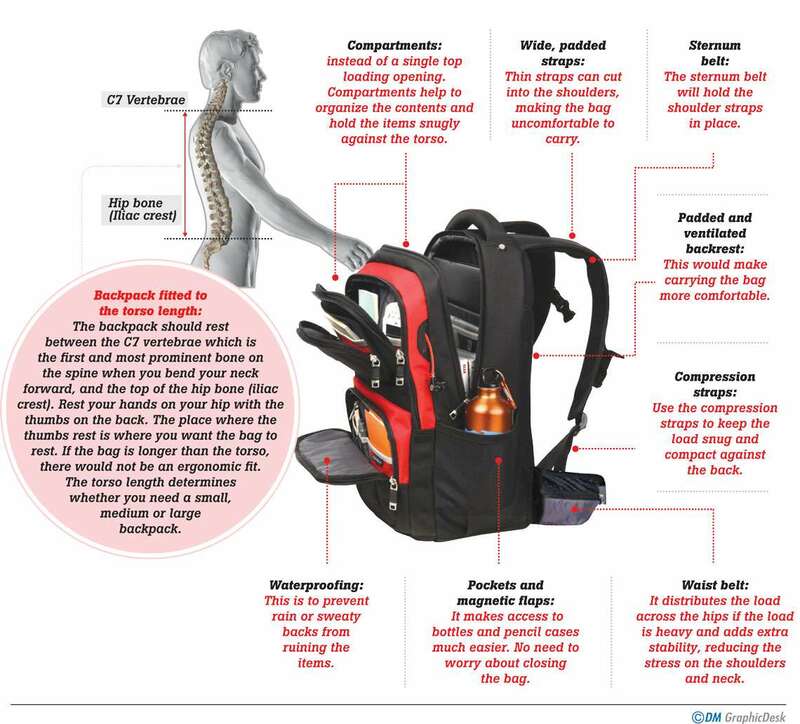 What is an “Ergonomic Backpack”? The incidence of backpack-related pain and injury continue to rise and has reached epidemic proportions. Additionally, what we see is probably just the tip of this iceberg, as kids under report pain and many parents discount the pain reports they do get, because “they are young” and they see no alternative. 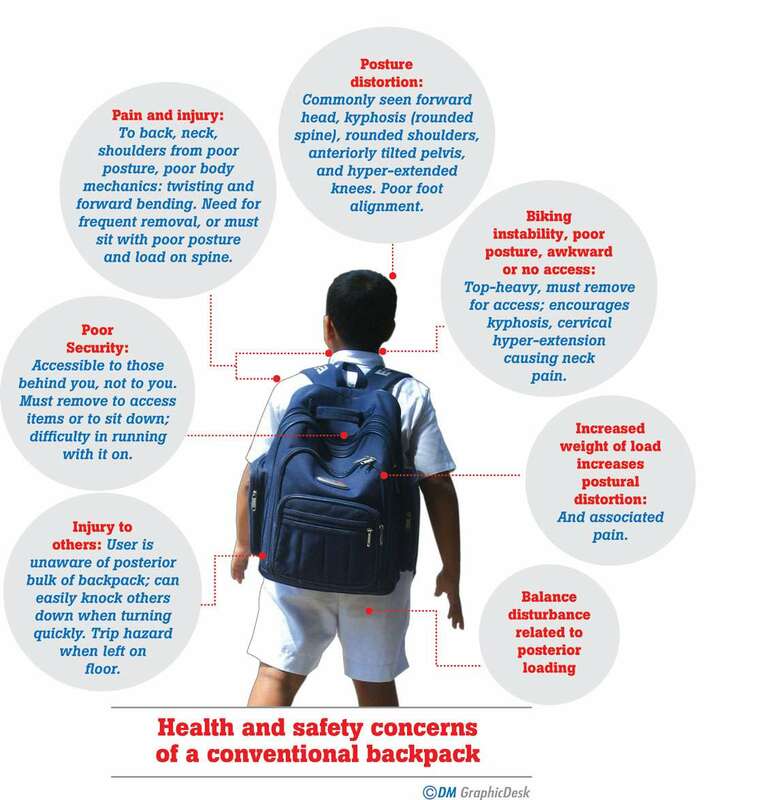 Conventional backpacks used as schoolbags adversely affect the health, safety and productivity of developing schoolchildren, in clear opposition to the goals of ergonomics. They are off-axis, posterior-loading systems, causing the body to compensate with postural distortion. It is postural distortion which is chiefly responsible for chronic musculo-skeletal pain. Any load applied off-axis is unhealthy for this reason. The postural distortion will continue unless the load is aligned with the body’s axis, in obedience to the laws of physics and physiology. As backpack-use for school has become widespread, numerous articles and programmes have offered instruction and guidelines in “backpack safety” and many manufacturers claim to offer “ergonomic backpacks.” These guidelines, and even legislation, focus on limiting the weight put in a conventional backpack. The term orthopaedic literally means a “straight child”. It is only during the growth period that one can affect alignment of bones with mechanical means other than surgery, and it is only during the growth period that bones can naturally build density, a lifetime investment. Therefore, unloading the body is not necessarily a healthy alternative for developing bones. Bones require daily muscle/bone resistance during the growth period in order to build density. Our young people are getting less and less activity and no posture training. Carrying books may be their only opportunity for adequate exercise to increase bone density and prevent osteoporosis, the leading cause of fractures in adults, and increasingly seen in children. Switching to a backpack with castors is a short-term remedy for discomfort, not a posture-training or bone density solution. A backpack with castors is actually heavier and more awkward when carrying is required (buses, stairs, irregular surfaces etc). 1. POSTURE DISTORTION: Commonly seen forward head, kyphosis (rounded spine), rounded shoulders, anterior tilted pelvis, and hyper-extended knees. Poor foot alignment. 2. PAIN AND INJURY: To back, neck, shoulders due to poor posture, poor body mechanics: twisting and forward bending. Need for frequent removal, or must sit with poor posture and load on spine. 3. INJURY TO OTHERS: User is unaware of posterior bulk of backpack; can easily knock others down when turning quickly. Trip hazard when left on floor. 4. POOR SECURITY: Accessible to those behind you - not to you. Must remove to access items or to sit down; difficulty in running. 5. CYCLING, INSTABILITY, POOR POSTURE, AWKWARD OR NO ACCESS: Top-heavy, must remove for access; encourages kyphosis, cervical hyper-extension causes neck pain. 6. INCREASED WEIGHT OF LOAD INCREASES POSTURAL DISTORTION: Associated pain. you should also AVOID any shoulder bags as these cause imbalances and strains on the body. 3. Lockers - Nowadays most schools have lockers. Encourage your child to use them, rather than carrying all their books with them. This helps reduce the load in the bag. Backpack fitted to the torso length - The backpack should rest between the C7 vertebrae which is the first and most prominent bone on the spine when you bend your neck forward, and the top of the hip bone (iliac crest). Rest your hands on your hip with the thumbs on the back. The place where the thumbs rest is where you want the bag to rest. If the bag is longer than the torso, there would not be an ergonomic fit. The torso length determines whether you need a small, medium or large backpack. Wide, padded straps - Thin straps can cut into the shoulders, making the bag uncomfortable to carry. Sternum belt - The sternum belt will hold the shoulder straps in place. Compartments instead of a single top loading opening - Compartments help to organize the contents and hold the items snugly against the torso. Pockets and magnetic flaps - It makes access to bottles and pencil cases much easier. No need to worry about closing the bag. Waist belt - It distributes the load across the hips if the load is heavy and adds extra stability, reducing the stress on the shoulders and neck. Padded and ventilated backrest - This would make carrying the bag more comfortable. Waterproofing - This is to prevent rain or sweaty backs from ruining the items. Compression straps - Use the compression straps to keep the load snug and compact against the back. Weight of the school bags the children should never carry more than 10 to 15% of their weight in a backpack. Girls complain more than boys of back pain, which may be due to their lighter body weights and typically heavier backpacks. Schools and teachers can help lessen the load by providing textbook storage, e-books whenever possible and a second set of books for home use, or offering photocopies in lieu of heavy texts. In practice, that would generally mean no more than 3.5kg to 5kg for a child in the first few years of school. Heavy backpacks representing 30% of the body weight and above may modify posture and gait. A child may develop poor posture or a slouching habit as he/she at back to basics. We believe in preventative measures, if you feel your child is experiencing any postural abnormalities, consult your physician as well as a qualified physiotherapist.